BOTHELL, Wash., March 1, 2018 /PRNewswire/ -- The U.S. Navy awarded Lockheed Martin (NYSE: LMT) a $150 million contract, with options worth up to $942.8 million, for the development, manufacture and delivery of two high power laser weapon systems, including intelligence, surveillance and reconnaissance (ISR) and counter-Unmanned Aerial System (counter-UAS) capabilities, by fiscal year 2020. 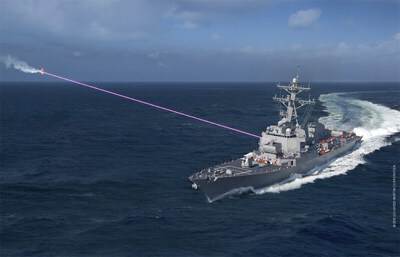 With the High Energy Laser and Integrated Optical-dazzler with Surveillance (HELIOS) system, Lockheed Martin will help the Navy take a major step forward in its goal to field laser weapon systems aboard surface ships. "The HELIOS program is the first of its kind, and brings together laser weapon, long-range ISR and counter-UAS capabilities, dramatically increasing the situational awareness and layered defense options available to the U.S. Navy," said Michele Evans, vice president and general manager of Integrated Warfare Systems and Sensors. "This is a true system of capabilities, and we're honored the Navy trusted Lockheed Martin to be a part of fielding these robust systems to the fleet." In this first increment of the U.S. Navy's Surface Navy Laser Weapon System program, Lockheed Martin will deliver two units for test by fiscal year 2020. One unit will be delivered for shipboard integration on an Arleigh Burke-class destroyer, and one unit will be used for land testing at White Sands Missile Range. "Lockheed Martin's spectral beam combined fiber lasers bring flexibility and adaptability to defensive and offensive missions," said Dr. Rob Afzal, senior fellow of laser weapon systems. "Our design is scalable, and we can optimize it to meet requirements for future increments." Lockheed Martin has more than 40 years of experience developing laser weapon systems. The HELIOS award leverages technology building blocks from internal research and development projects, including the ATHENA system and ALADIN laser, as well as contract experience gained from programs such as the U.S. Army / Directed Energy Joint Technology Office RELI program, the U.S. Air Force LANCE program and the U.S. Navy HEFL program. For more information, visit: www.lockheedmartin.com/laserweaponsystems.